Cowley College recently selected five men and five women as finalists for the homecoming festivities set for Wednesday, February 10 at Cowley College. Initial voting was held the first two weeks of December to narrow the field to the five finalists. Candidates were nominated from various clubs and organizations on campus. The final voting will be held when the students return from winter break and the King and Queen will be crowned at halftime of the men’s basketball game vs. Coffeyville on February 10. 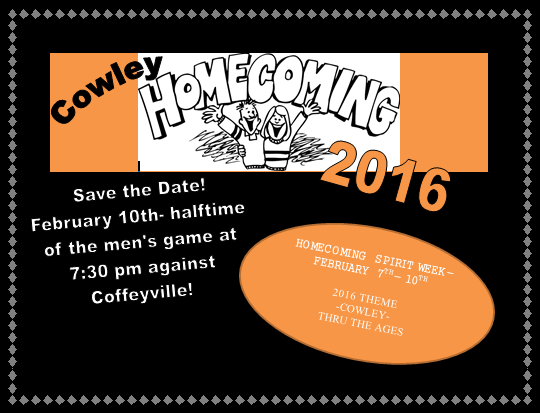 The homecoming theme this year is “Cowley Thru the Ages”. Amy Austin of Arkansas City. Logan Morrow of El Dorado. Maranda Oak of Arkansas City. Mason Loewen of Vancouver, BC. Arnoldo Ruiz of Arkansas City.